16 year old Indica Huddleston has been missing since 5 pm Friday, August 16, 2013 in Alpine, Utah. Huddleston is is 5’3″, 128 lbs, long dark brown hair, olive skin and hazel eyes. She reportedly had a fight with her parents about school and is presumed to have run away from home. However, her family believes she is in danger and may have been lured away from home by a man she met on Facebook. According to Haylee Pettis, a family friend, Huddleston left a note at her home on Friday afternoon after she had been in an argument with her parents about school. In essence, the note simply stated that she would be taken care of. Family and friends believe that Huddleston may be with an older individual and are concerned for her safety. After reviewing Huddleston’s recent activity on Facebook, they had seen that she had been having conversations with some people in Logan. Police investigating the disappearance of a 16-year-old girl may be elevating her status to an endangered missing person. Although that won’t necessarily change the way the investigation into what happened to Indica Huddleston is handled, police hope the new label will draw more attention from the public. “The fact that she’s been gone now for six days, hasn’t contacted anybody, you know, relatives or friends that we are aware of … we are looking at maybe elevating this more from a runaway to a missing child,” said Lone Peak police detective Dave Ventrano. Her family, however, is growing increasingly concerned that Indica may be with a dangerous person. Indica was last seen about 5 p.m. on Aug. 16. Her family found a note indicating that she had run away. But they also believe there is strong evidence to suggest she may have taken off with — or been lured away by — an older man she met on Facebook. 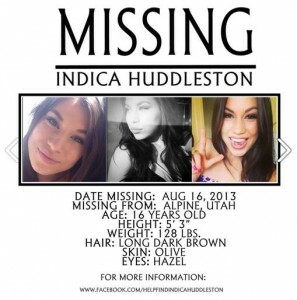 If anyone has seen Indica Huddleston or has information about her whereabouts, they are encouraged to contact the Lone Peak Police Department at (801) 756-9800. UPDATE I: Indica Huddleston found safe after missing a week. Indica Huddleston was found safe and uninjured shortly before 6 p.m. Friday and was interviewed Friday night by members of the Lone Peak Police Department and the FBI, her family confirmed.